We hope you weren’t expecting the 2020 Acura TLX to get any major updates. The 2020 Acura TLX has just arrived at US dealerships, but if you were expecting any significant changes from the 2019 model, prepare to be disappointed. New for the 2020 Acura TLX is a choice of four new premium exterior paint options: Performance Red Pearl, Majestic Black Pearl, Canyon Bronze Metallic, and Apex Blue Pearl. The latter is exclusive to the sporty TLX A-Spec trim introduced for the 2018 model year and each color option costs $400 more than the standard colors. Acura says these advanced paints are engineered using cutting edge pigment technologies such as micas, metal flakes and nano pigments for super-high transparency. Each premium paint color receives additional coats to enhance the color intensity and depth along with a special clear coat. Other than that, the 2020 Acura TLX remains unchanged. Like the 2019 TLX, two powertrains are available: 206-horsepower 2.4-liter i-VTEC mated to quick-shifting 8-speed dual clutch transmission, and a 290-horsepower 3.5-liter i-VTEC V6 paired with a nine-speed automatic. All front-wheel-drive TLX models come with the Precision All-Wheel Steer system as standard, while TLX V6 models can be equipped with Acura's Super Handling All-Wheel Drive technology that allows up to 70% of torque to be distributed to the rear wheels, and up to 100% of that torque to be transferred to either the right-rear or left-rear wheel. As standard, the 2020 Acura TLX comes with the AcuraWatch suite of advanced safety and driver-assistive technologies, Jewel Eye LED headlights, a 10-way power driver’s seat, heated front seats, Smart Entry with push-button start, and a dual-screen user interface (ODMD 2.0), with Apple CarPlay and Android Auto integration. 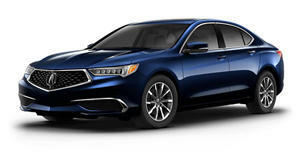 Available optional features include a 360-degree Surround View Camera system, heated steering wheel, next-generation AcuraLink connected services and a 10-speaker Acura/ELS Studio Premium Audio System. Prices for the 2020 Acura TLX also remain unchanged, starting at $33,000 for the base 2.4L FWD model and $45,950 for the V6 AWD with the Advance package. These prices exclude the $995 destination charge.